Do you like Gretchen Rubin? Me too! Everything she preaches is simple, logical, doable and fun. No moving to Himalaya for the long meditation practice, no ultra marathons or trips around the world. Gretchen talks about tiny things that each one of us can try in order to have a happier life and better habits. I love everything that she does, her blog, her books and her podcast. (She also has an awesome Facebook page.) If you haven’t already, check her out. And today, I compiled my favorite pieces of Gretchen’s wisdom that I use daily. Enjoy! (This is going to be the topic of Gretchen’s next book.) In her book “Happiness Project” Gretchen incorporated many of new habits in her life, instantly and successfully. Then, a lot of people asked her how she managed to do that. Gretchen thought that you just start doing something and it becomes your habit. The more she talked with people, the more she realized that this might not be true for everyone, because people adopt new habits in different ways. She realized that people can be divided into four different categories, based on the way how they respond to expectations created by themselves and created by others. The image below shows all four types, with a description for each. 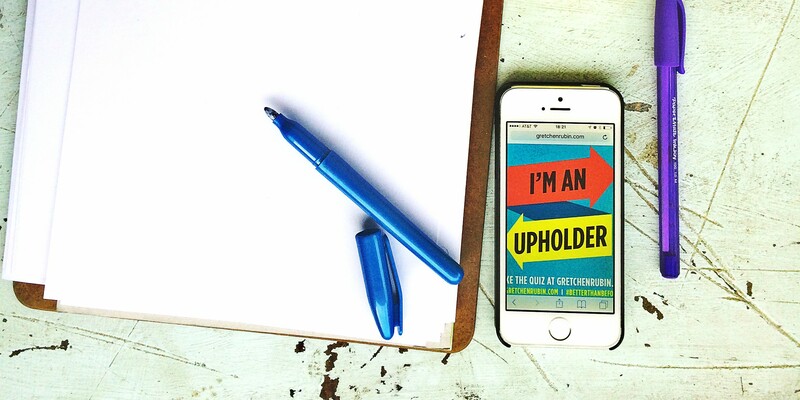 I am an upholder and my husband is an obliger. We are a pretty good combo. (Another upholder would probably drive me nuts.) A few of my coworkers are questioners and knowing their tendencies helped me work with them better. (Instead of saying: “Man, do the goddamn thing already, I don’t know in which ways it’s gonna impact the balance in the Universe!”) I know only two or three rebels. Important note: These categories are not set in stone, you can belong to different categories at once or in different realms of life. The point of this is to know yourself better and learn how to adopt new habits in an easier way. 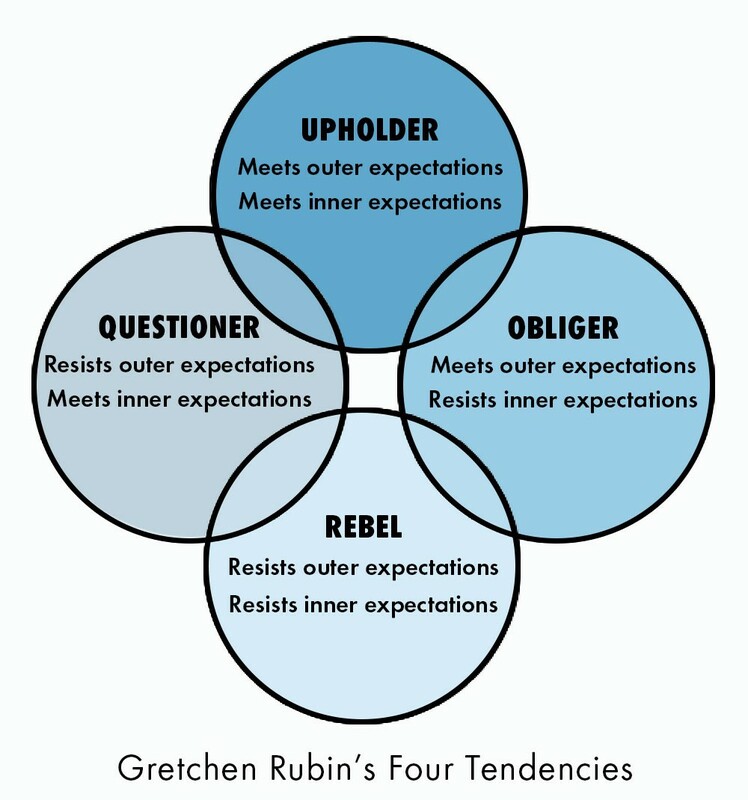 Go HERE to watch a video where Gretchen explains four tendencies in detail. 2. Strategies of making habits stick: scheduling, tracking, convenience. If it’s not scheduled, it’s not real. If you are trying to incorporate a new habit and you have no idea when in your day/week it’s going to fit, you will likely skip it after a few enthusiastic trials. You will have to decide when the timing is right, whether you feel like doing it or not, and you may also forget. When it’s on the calendar, you made the decision once and it’s there. It’s easier to be consistent with scheduled things. Tracking is another great strategy because it makes you visualize your So progress. I use a simple calendar and color pens. There are hundreds of apps for habit tracking (Way of Life is a good one). Either way, tracking boosts your motivation, gives you a sense of accomplishment and turns habit-making into a game. Finally, the strategy of convenience is all about making your new habit as convenient as possible. We have all heard about the example of putting your gym clothes next to your bed so that you don’t skip the morning workout. I learned from Ben Austin that we fail in creating the habits when we rely only on our willpower, without creating the environment that will support the new habits. The strategy of convenience exactly helps with that. 3. Acknowledge the reality of other people’s feelings. When someone says: “Oh, I feel so bad about XYZ,” our first reaction is typical: “No, come on, you shouldn’t feel bad, that’s nothing!” We consider it our best and most loving way to reassure the other person that everything is OK. In fact, we are undermining other person’s feelings. We are sending the message that the way they feel is not appropriate. Next time in the similar situation, acknowledge other person’s feelings. Say: “I know, right? You feel bad because of XYZ. But don’t worry, we’ve all been there.” Most of the time we don’t want anyone to solve our problems for us. We want someone to listen to us and tell us that we’re not alone. 4. The outer order creates inner peace. Gretchen and I both love decluttering. Definitely, outer order contributes to inner peace. If you feel nervous or anxious, tidy up a messy drawer, desk or a cabinet. Or try a one-minute decluttering challenge. The happiness that tidying up can bring you is completely disproportionate to the invested effort. You invest a few minutes, you feel terrific for hours. Good sleep is the foundation of happiness and good habits. ((Tweet this!)) We all know the situation: after the dinner you start watching your favorite TV show, one episode after another and the next thing you know, it’s midnight, you don’t feel sleepy and you don’t know what to do. Go-to-bed alarm will indicate you when is the time to close the store and get ready for the bed. Sleeping is a great time investment. Go-to-bed alarm will make it a priority. 6. Happiness doesn’t always feel happy. This is a big one! In our motivation-driven, follow-your-passion world, we tend to forget that we can do things that we don’t feel like doing. ((Tweet this!)) (Nicole Antoinette opened my eyes about this.) And that these are usually the things that will make us happy and proud once we’re done. When did you last time feel like working out, reaching out to a new client, or having a difficult conversation? Probably five years ago. And how does it feel to complete a workout, reach to a new client, get done with a difficult conversation? Terrific, liberating, powerful. It is naive to think that happiness is only rainbows and unicorns. It includes a lot of hard work, visits to a dentist, facing your fears, building new habits and taking full responsibility for your life. Happiness doesn’t always make you happy. ((Tweet this!)) But yes, it does make you happy in a long run. 7. Envy is a powerful emotion. That’s how Gretchen discovered that she really wants to become a writer. She had a career in law, but she realized that she envies writers way more than people who get promoted in the world of law. Envy can feel embarrassing, uncomfortable, like something you should have overcome by now. In fact, envy is just one emotion in the spectrum. A powerful one because it can show you what you really want. Don’t judge your envy, use it as a tool for introspection. 8. Act the way you want to feel. This tip changed the course of my cranky November day radically. And of many days afterward. The best part: you can act the way you want to feel right about NOW. 9. Things get messier before they get tidier. Whenever I write, I make a huge mess on the page with all the ideas, tips, tricks and superficial sentences (“I really, truly recommend you to try this, from the bottom of my heart,” and that kind of stuff.) Then I start editing and get rid of everything that doesn’t help convey the idea, no matter how cool it sounds. This is true for most of the processes, you need to make the mess before you can make a harmony. ((Tweet this!)) Whether you’re tidying up your desk or you’re preparing the speech, don’t be afraid of making a mess. That’s just the necessary phase. 10. My happiness project is not your happiness project. In “Happiness Project” Gretchen defined “The Secrets of Adulthood” and the first one on the list was: “Be Gretchen”. Gretchen encouraged herself to be… herself. To like what she likes, not what others like or think is cool. (Remember “The Book of You”?) Each one of us will have our own happiness (or any other) project. What lights my fire, you may find boring. What you have on your bucket list, I may consider crazy. We are all different and we should all search for our happiness in different ways. How do you like this list? I think it’s cool because you can apply every single one of these tips today, without using anything special. (My ebook provides a similar experience.) Gretchen has many more tips worth checking out (here, here, here). If you want to be happier and develop (and keep) good habits, she is the person to follow. If you like this article, you may also like my blog, Facebook and/or Twitter. Originally published at www.missstrangelove.com on May 27, 2016.